Ruth Taggart was a student at the Chicago Academy of Fine Arts during the 1930s. One of her professors, Bruce Goff, took the class to visit Taliesin at Spring Green, Wisconsin. In 1951 Ruth and Quintin Blair were visiting Arizona. She suggested that they visit Taliesin West in Arizona, where Wright now lived and worked. Wright met them in the driveway, lead them on a tour and invited them to stay for lunch. At the luncheon, Wright offered to design a home for them. In 1951 they purchased a 40 acre parcel of land in the Big Horn Basin (NRHP) a few miles east of Cody. Viewing the property today, with all its lush vegetation, it is hard to image how barren and desolate it look at the time. Besides the wide open space, one of its redeeming features was a stream that meandered through their property which they dammed to create a pond. They began planting a wide variety of trees, and today the home is barely visible from the road. The Blairs collected prairie styled art glass light fixtures and dining room chairs from the demolished Yellowstone Canyon Hotel. One of the double stained glass light fixtures is mounted on a stone pedestal in the front yard and the second is on a pedestal in the Garden Court. Changes and additions have been fluid over the years. In 1981 they hired Bruce Goff, the architect that introduced Ruth to Wright, to design a Master Bedroom, add a two car Garage, enlarge the kitchen, create a formal dining room, and create a Library in place of the old Workspace. While Ruth was probably the impetus for selecting Wright, Quintin was just as involved in the process. Like many of Wright’s clients, he supervised the construction himself. The Blair Residence was placed on the National Register of Historic Places in 1991. Photographed on August 23,1974. 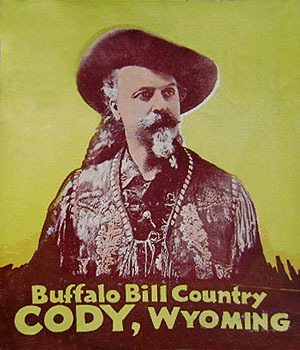 Courtesy Buffalo Bill Historical Center. Photographer Jack Richard. 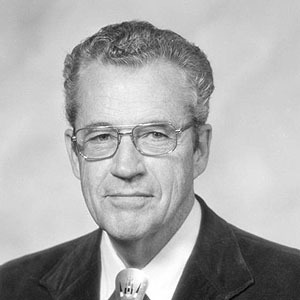 Quinn Blair 1952. 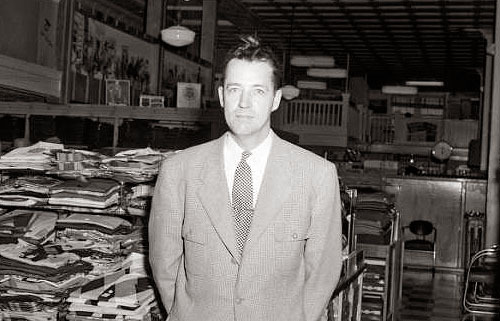 Quinn Blair standing in front of shelves in Cody Trading Company. Photographed in 1952 by Jack Richard. Courtesy Buffalo Bill Historical Center. 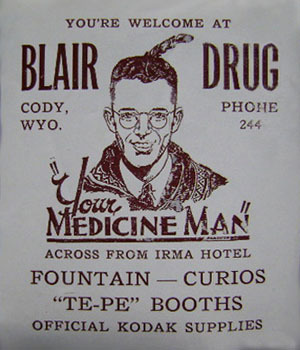 Quinn Blair had his pharmacy license and owned Blair's Drugs. 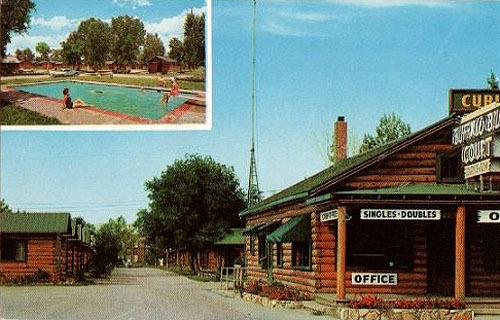 Postcard circa 1950. 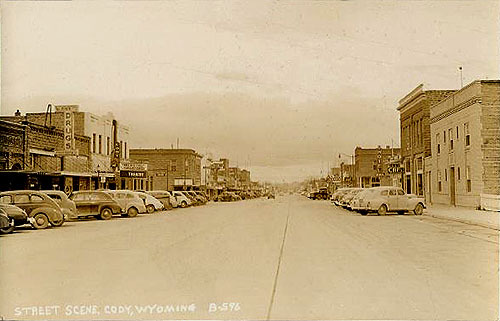 "Street Scene, Cody, Wyoming." Blair's Drugs and Cody Theater on the left, Irma Hotel on the right. Blair's Drugs 1959. 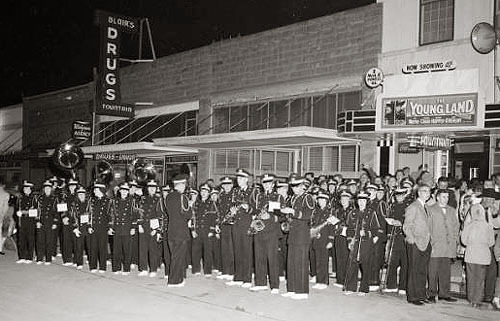 Cody High School band and others standing in front of Blair's Drugs and Cody Theatre in Cody, Wyoming for the opening of film "Young Land". Patrick Wayne, the son of John Wayne, stared in dozens of movies and television episodes. He stared with Dennis Hopper in the film "Young Land" (1959), and had the lead roll as Sheriff Jim Ellison. The opening of the film "Young Land" in Cody coincided with the opening of the Whitney Gallery of Western Art, April 23-24, 1959. Photographed by Jack Richard. Courtesy Buffalo Bill Historical Center. Quintin Blair 1959. 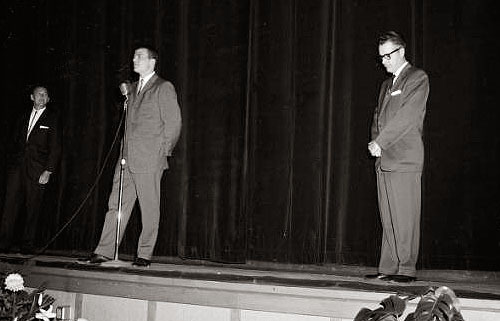 Patrick Wayne (center) with Quintin Blair (right) at Cody Auditorium in Cody, Wyoming for the opening of the Whitney Gallery of Western Art. Patrick Wayne, the son of John Wayne, stared in dozens of movies and television episodes. He stared with Dennis Hopper in the film "Young Land" (1959), and had the lead roll as Sheriff Jim Ellison. The opening of the film "Young Land" in Cody coincided with the opening of the Whitney Gallery of Western Art, April 23-24, 1959. Photographed by Jack Richard. Courtesy Buffalo Bill Historical Center. Ruth and Quinn Blair 1963. 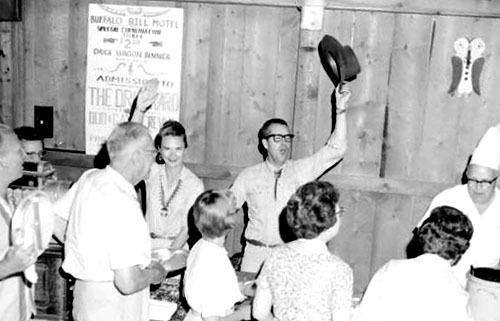 Ruth and Quinn Blair waving while serving their Chuckwagon Dinner at the Buffalo Bill Motel. August 16, 1963. Photographed in 1963 by Jack Richard. Courtesy Buffalo Bill Historical Center. Postcard circa 1950's. 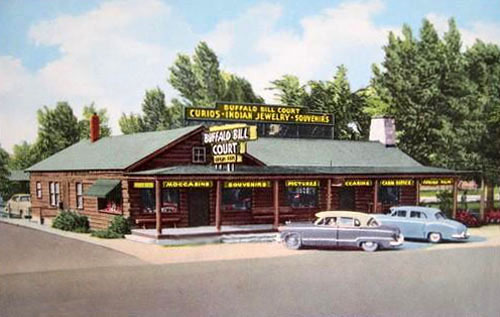 Buffalo Bill Court, Cody, Wyoming. Curios, Indian Jewelry, Souvenirs. Postcard circa 1972's. Holiday Inn, Cody, Wyoming. “Bottoms Up” by Edward T. Grigware. According to the tale told by the front desk at the Holiday Inn, Cody Wyoming. Edward T. Grigware was a well-known artist, most notably in Cody, Wyoming for his historic Cody murals. An acquaintance of Quintin Blair commissioned Grigware to produce a painting of his mistress. All four women in the painting are the same woman. Upon his death, his wife wanted it out of her home. Immediately. Quintin found out, paid $1 for it and hung it in the Teepee Tap Room of the original Buffalo Bill Village resort. 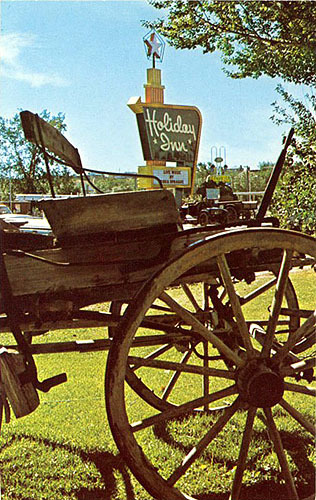 In 1972 with the opening of the Holiday Inn, the painting was moved to its present location "The Bottoms Up Lounge". Stop in, view the lounge and ask for a free postcard. In 1978 Quintin and Ruth Blair were involved in publishing a book on Bruce Goff. It was published on the occasion of an exhibition of the art and architecture of Bruce Goff for presentation at the Yellowstone Art Center, Billings, Montana, May 5 - June 11, 1978. Soft Cover. Published and manufactured by Quintin and Ruth Blair, F. Wayne and Pat Gustafson, Delton and Janet Ludwig for the Yellowstone Art Center, Billings, Montana. Ruth Taggart Blair, 89, died Aug. 21, 2007, at West Park Hospital following injuries sustained in an auto accident the previous Saturday. She was born Sept. 19, 1917, to Lloyd and Louise Taggart in Cowley, the first of nine children. She married Quin Blair on Sept. 15, 1946. Ruth was a longtime Cody resident. She was a graduate of the Chicago Art Institute with a varied career as lead designer for Thomas Molesworth, an interior decorator, co-proprietor of the Buffalo Bill Village and eventually Quin Blair Enterprises. Ruth, together with her husband, was an icon in the endeavor of Western hospitality in Wyoming. She was instrumental in the development of the Western Design Conference in Cody. 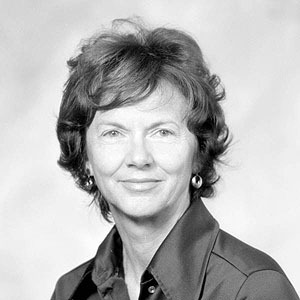 Prior to 1999 she was an active member of the Frank Lloyd Wright Foundation. She was an active and lifelong member of the Church of Jesus Christ of Latter-day Saints. She is survived by her husband of 61 years, her son Frederick "Ted" (Judie) Blair, grandsons James (Emily) Blair, Quintin Blair and Taggart Blair, great-grandson Taylor Blair, her brother Scott Taggart, sisters Mary Louise Greever, Harriet Burtus, Becky Watkins and Ray Rita Keif, and numerous nieces, nephews, cousins and friends. She was preceded in death by brothers Jesse "Mac" Taggart, Lloyd Taggart and Charles Taggart. Funeral services were Aug. 24 at the Church of Jesus Christ of Latter-day Saints Stake Center. Interment followed in Riverside Cemetery.